Looking for a kid-friendly vacation rental on northwest Florida's Emerald Coast? 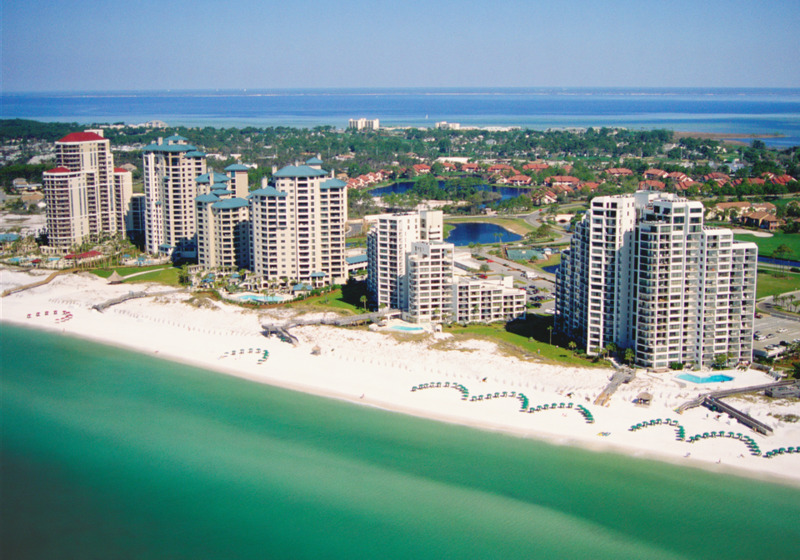 Sandestin Golf and Beach Resort offers plenty for families to love. This enormous Sandestin resort community sprawls over 2,400 acres, straddling between the Gulf of Mexico and Choctawhatchee Bay. There are seven miles of sugary white-sand beachfront on one side and a calm bay on the other side where many water sports are located. Rates include access to a ton of complimentary activities, from water sports to nature hikes, daily kayak rentals, and tennis. Like exploring by bike? Guests receive two complimentary four-hour bicycle rentals each day of their stay per unit. Does your family golf? Each of the four courses (Raven Golf Club, Baytowne Golf Club, The Links Golf Club, Burnt Pine Club) have their own challenges, thanks to course designers like Robert Trent Jones, Jr., Rees Jones and Tom Jackson. These courses are the real deal, having attracted high-profile events and competitions including the Champions Tour and NCAA National Championships. Sandestin offers several junior golf programs throughout the year, with a discount for kids ages 17 years and under. Need a babysitter when you're golfing or hitting the spa? For kids ages 4-12, Club KZ is a supervised program that runs from 9am to 2pm. Rates are $55 per child, including lunch. There's also a fantastic adventure zone with high ropes and more, plus an arcade, and nature center. Beachside: This area is closest to the Gulf and features easy beach access, picturesque lakes, winding bikepaths, a basketball court and mini golf at the Dunes Putting Course. It is a 20-minute tram ride to the Village's dining and entertainment options. Bayside: Located on Choctawhatchee Bay, this area offers ponds for fishing, bike paths for exploring, and its own pool area. The Village of Baytowne Wharf: This area is the heart of the action, close to family fun-zones, shopping, dining, street performers and live entertainment. Each building has a swimming pool, and the location is close to the Baytowne Marina, tennis center, and family-friendly Jolee Island. Note that it is a 20-minute tram ride to the beach. Lakeside: This area is shadier and quieter than the others, near lakes and the fairways of the Baytowne and Raven links. The closest airport to Sandestin is the Northwest Florida Regional Airport (VPS), about 25 miles from the resort. Pensacola's airport (PNS) is about 50 miles west of Destin, and Panama City (ECP) is 45 miles east. Nearly 1300 guest rentals are offered in many different "neighborhoods"
The Village of Baytowne Wharf has a pedestrian-only cobbled lanes and a fine mix of restaurants, shops, and entertainment. Junior golf program; and small kids can take lessons with a parent. Disclaimer: As is common in the travel industry, the writer was provided with complimentary services for review purposes. While it has not influenced this review, About.com believes in full disclosure of all potential conflicts of interest. For more information, see our Ethics Policy.